As most of you know, I have a new book coming out October first. 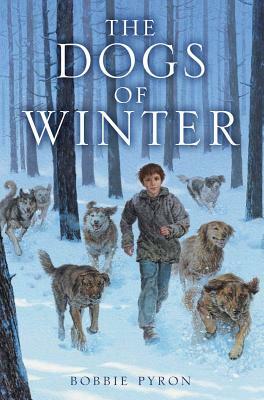 The book is called, The Dogs of Winter, and it's being published by Arthur A. Levine Books (Scholastic), and edited by The Man himself! I'll be blogging about this book a bit over the next five weeks, but I thought what I'd do in this first blog is tell you the "story behind the story." My book is based on a real child named Ivan Mishukov, and two amazing, heartbreaking, and ultimately (for me) inspiring years in his young life. Ivan, like tens of thousand of other children, found himself abandoned to the streets of Moscow in the mid 1990s. Yes, I said the 1990s, not the early part of the 20th century! When the Soviet Union fell in the early 1990s, the socio-economic impact on the people of Russia was devastating. Families who were barely hanging on by a thread suddenly found themselves without any kind of safety net. Yes, there had been food shortages and the infamous food lines when the Soviet Union was still in tact, but rent was controlled (by the government) to a minimal charge, health care was free, and pensions existed. All of that, plus much more, went away within just a few short years. 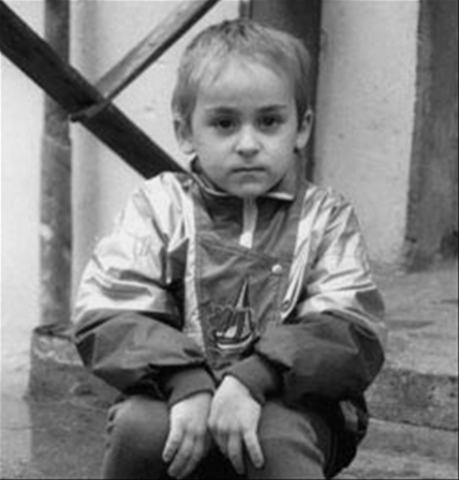 By the mid 1990s there were an estimated 80,000 to 1 million children and teens living homeless on the streets of Moscow and St. Petersburg. The vast majority of these children were considered "social orphans." They had at least one living parent. At the same time, dogs were abandoned to the streets to fend for themselves as well. Anything that required money for food, shelter and care was abandoned to the streets. Most of these homeless children lived in the extensive (and elegant) underground train stations in Moscow. There, they would form packs (often lorded over by an older teen or adult) and beg, steal, and forage for food, alcohol, and drugs. They became as ever-present and invisible as the cold. They were often exploited and harmed by adults, even the police. Ivan's young age did not set him apart from the other children. Many of these "orphans" were under the age of ten. Ivan was four when he ended up on the streets. What did set him apart was the fact that Ivan, for whatever reason, chose to throw in his lot with a pack of feral street dogs rather than a pack of children. For two years, he survived the notoriously cold Russian winters and the dangers of the street by living with the pack. 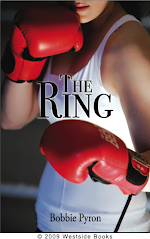 My book is a fictionalized account of those two years. I first came across Ivan's story in 2005 in an article on feral children. When I read it, the hair stood up on the back of my neck and I shivered all over. I knew that if I never wrote another book (or any book for that matter) I had to write Ivan's story. I made a copy of a photo of Ivan taken not long after his capture and separation from the dogs and pinned it to the bulletin board in my office. Every day I looked at those haunted eyes and promised him I would write his story. It took eleven years, but I kept that promise. Fido and Friend in Five: Lois Szymanski and Rylant! Okay, so you know how you meet someone and you just connect? It's like you've met a long-lost sister or brother you never knew you had? Well, that's the way I feel about Lois Szmanski. We have so much in common! 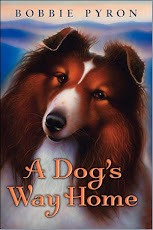 We both love shelties, we both had difficult childhoods made bearbable by books. We both read the Misty of Chincoteague books over and over and over as kids, and we both feel most at home by the sea. Oh, and we are both authors. See what I mean? 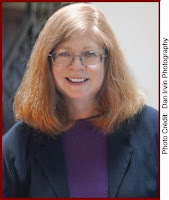 Lois is the author of over 20 children's books, including fiction for young readers, picture books, and nonfiction books for kids. And many of these books reflect her love for horses and for the ponies of Chincoteague Island. Her newest book, Wild Colt, is absolutely breathtaking. Lois's love for horses has not only influenced her writing, its led her to help others. Lois helped create The Feather Fund, a nonprofit organization that helps children purchase Chincoteague pony foals. And you better believe you can find Lois (and often her faithful sheltie, Rylant) right there in the thick of things during Chincoteague Island's pony penning week! 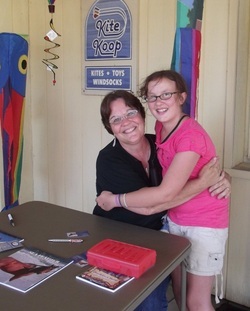 Lois also teaches writing and is very involved with SCBWI (The Society for Children's Book Writers and Illustrators). 1. How did you and Rylant find each other? When our family dog, Springer, passed I had a hard time adjusting to life without a dog. I was working full time by then. I thought it would be unfair to a puppy to leave him home alone so much, so I took in a cat instead. From time to time as the years passed, my daughters, Shannon and Ashley, asked if I would ever get another dog. I always said, yes, but not until I could quit work. When I do get another dog, I always said, it will be a Sheltie or a Border Collie. I love both breeds but had always adopted from shelters. (Springer was a wonderful Border Collie/Husky/Lab mix. ).Ten years after Springer passed I got a great advance with a series contract and decided to leave my job at McDaniel College to write full time. By then, I’d forgotten about getting a dog. I’d settled into life with my cat, which is by the way, NOTHING like life with a dog! That winter, my daughter, Ashley showed up Christmas morning with a puppy in her arms, a big blue bow on his neck. I melted. “You always said…” she told me. My husband shook his head, “No dogs!” he said. “That’s just great,” he replied. “Now we’ll have to get a sheep.” We didn’t get a sheep and Ryley won over Dan in no time flat. Ash told us she’d chased ad after ad going all over the state looking for a “Sheltie that looked like a Border Collie,” which cracked me up. I named him after one of my favorite authors, Cynthia Rylant. 2. What makes Rylant's tail wag? Almost anything. He loves doing agility. He loves playing fetch. He loves walks in the park and rides in the car, but he goes nuts over flashlights. He chases the beam wildly, bounding over barriers and going up walls. I can’t even whisper the word flashlight without him barreling into the room. Even as I type the word I look up for him, because he might be able to hear the click of the letters and sound it out! 3. What's your all time favorite dog story? 4. If Rylant could change just one thing about you, what would that be? He’d make it so I could run again without falling down. 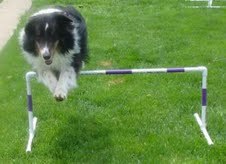 He misses doing agility and would have been great in the show ring. We only tried that once and I couldn’t keep up with him. We still fool around in the backyard in small doses. When I pull out the equipment, he does donuts, barking and running to weave and jump and dash through the tunnel. He’d also probably tie himself to my body so I’d never go away without him. Happiness in motion, my friend. Thanks so much to my dear friend and kindred soul, Lois, for visiting with us today. Be sure and check out her website to see what all she's written. She's amazing! 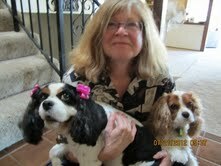 Fido and Friend in Five: Linda Johnston, Lexie and Mystie! Linda O. Johnston is on a mission: to raise awareness about pet rescue. 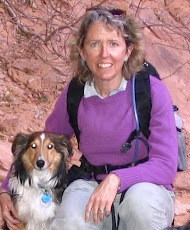 Like many of us, her love for her dogs (and their love for her, of course) has influenced her writing. 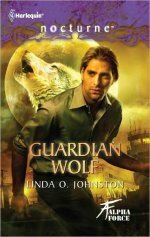 Much of her fiction involves animals--shapeshifters in her paranormal romances and real animals in her mysteries. But Linda also walks the walk. She volunteers at Pet Orphans of Southern California as a "dog adoption counselor." As she says on her website, "Researching and writing about pet rescues has become my passion." 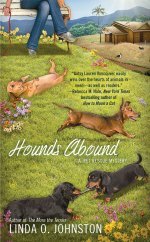 And here's a really cool thing: her mystery series publisher, Penguin Group, has chosen Linda to participate in their "Read Humane Program." Berkley Prime Crime (Penguine Group) has donated a substantial amount of money to the Humane Society of the United States Animal Rescue Team. Books chosen by this "Read Humane" program get a special Read Humane seal and special store displays. Very, very cool. 1. How did you and your dogs find each other? 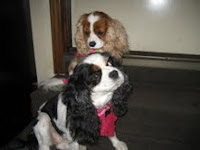 We found our current dogs, Lexie and Mystie, at breeders. They’re Cavalier King Charles Spaniels, and I fell in love with the breed decades ago on my first trip to London when I saw a woman with a couple of Cavaliers on the London Underground. When I returned to the United States I really had to hunt to find Cavaliers, since they were a rare breed back then. But I’m not the only one to love them, and now they’re a whole lot more popular--and available--now. 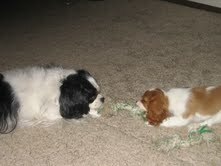 Panda was my first Cavalier, and Lexie and Mystie are my seventh and eighth. And yes, I write Pet Rescue Mysteries now for Berkley Prime Crime and am now much more attuned to rescuing needy animals. I want Lexie and Mystie to live forever, but if I ever decide I need a new pet there are Cavalier rescue organizations that I’ll try first. 2. What makes Lexie and Mystie's tails wag? Having my husband Fred and me obey their commands. Lexie likes to have our front door open so she can watch the world through our wrought iron gate, and Mystie loves for us to kick her squeaky balls. Both give us orders when they want to go outside or want treats. I love watching their tails wag so I’m likely to follow their orders. I also like it when their tails thump a rhythm on the wall or floor when they wag decisively. Can’t name just one. First of all, my favorites are my own Pet Rescue Mysteries, and the predecessor Kendra Ballantyne, Pet-Sitter Mystery series. I also enjoy some, but not all, books in the dogs’ point of view, such as The Art Of Racing In The Rain, by Garth Stein, and Spencer Quinn’s Dog On It. In fact, I like most books where dogs play a major role. 4. If Lexie and Mystie could change just one thing about you, what would that be? They’d want me to be at their bark and call even more frequently--all the time! I’m a cynophilist; they’re family! Confession: I had to look up cynophilist. It means a dog fancier. Guess I'm one too! Thanks so much to Linda and her pups for visiting with Fido and Friend in Five. You can find out all kinds of cool things about Linda and her books on her website and her blog!